Ghost slaying, mouse housing, flight controlling and fish finding this week! Slayin' makes me feel gooood! North America is clearly the territory to envy thus far this year with weekly updates featuring a variety of downloads for the Wii and DSi. Whilst retro-gamers will bemoan the absence of any Virtual Console releases this time around, there's still a bevy of budget WiiWare releases to check out and a mix of games on DSiWare to complement them. GhostSlayer (600pts - Gevo Entertainment) – If you feel knocking Miis off raised platforms at Wuhu Island has gotten a bit stale, you may want to have a go at slaying ghosts in this Chinese mythology-inspired action title. Whilst the review is pending you'll probably want to check out our interview with the developers for more information on this freshman release from Gevo. Mouse House (600pts - Big John Games) – This colourful maze game features cute character designs and retro gameplay that should appeal to old-time gamers. Expect a review from us soon. Family Go-Kart Racing (500pts - Aksys Games) – The "Family" series isn't known for being the best of WiiWare games, but we'll take a few spins and let you know what we think of it. Who knew the most stressful job in the world would make a good game? Aura-Aura Climber (200pts - Nintendo) – This looks like a new title rather than a localised Japanese title and a nice little bit of arcade-style gaming on the go. Our own mountaineering experts will get on the case and see if this scales the heights or not. Flight Control (500pts - Firemint) – We thought this was a perfectly capable port of the popular iPhone game, so puzzle fans may want to consider booking their excursion today. Faceez (200pts - Neko Entertainment) – Faceez marks the DSiWare debut of the veteran publisher, probably better known in the download scene for WiiWare titles like Heracles Chariot Racing and the Cocoto series of games. This seems to be a little photo manipulation app rather than a proper game, but we'll put it through its paces and let you know if it's good for a laugh. Flipper (500pts - Xform) – It's been a long time coming as our developer interview will attest and we'll be sure to let you know if it was worth the wait. Let's say you're relaxing at home, but something doesn't seem quite right. Maybe your house has ghosts. Clearly you need to get GhostSlayer, with its Wii MotionPlus™ accessory functionality, to figure out how to deal with them. Or maybe your house has a mouse. Mouse House™ puzzles seem the logical choice for you. Maybe you just need to get out of the house and try some fresh air with Family Go-Kart Racing. If it seems a bit brighter than usual outdoors, that's probably because Aura-Aura, the star of Aura-Aura Climber™, has fallen out of the sky. While you're out having fun, take and share some crazy pictures of your friends and family with Faceez, or spend a few relaxing hours directing flights with Flight Control™. And while you're out there, you might want to spend some time helping a little boy recover his lost pet goldfish, Flipper. Description: Embark on a thrilling ghost-fighting experience. 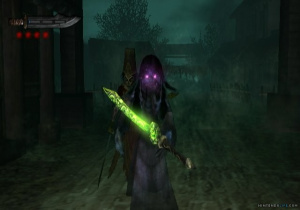 Play as a Ghost Slayer as you battle evil spirits that plague the mortal world. Your sword is your only weapon against them. Eliminate all hostiles in your path and defeat the Ghost Queen in the final stage in order to save the world. Unlock new swords and acquire special techniques that you can use to your advantage. Test your skills by playing all three levels of difficulty. Enjoy the thrill of slashing ghosts and vaporizing them by swinging your Wii Remote™ controller and experience sword-fighting game play at a new level of realism by using Wii MotionPlus accessory (this game can be played with or without Wii MotionPlus). Brace yourself for the onslaught of blood-thirsty spirits. Nintendo adds new titles to the Nintendo DSi™ Shop and the Wii Shop Channel at 9 a.m. Pacific time on Mondays. Users with broadband Internet access can redeem Wii Points or Nintendo DSi Points to download the games. Wii Points can be purchased in the Wii Shop Channel. Nintendo DSi Points can be purchased in the Nintendo DSi Shop. A Nintendo Points Card™ can be purchased at retail locations. All points from one Nintendo Points Card must be redeemed in either the Nintendo DSi Shop or the Wii Shop Channel. They are not transferable and cannot be divided between the two systems. I wanna try Flight Control! I'm still waiting for Shantae and PW: TT. I'm interested in Family Go-Kart Racing. Wow. Great update! I may be spending a hefty sum this week! I'm interested in Ghost Slayer, Faceez, Flipper, Aura-Aura Climber, and Flight Control. An SD menu DSi update can't come soon enough(crosses fingers for Wednesday). I'm really curious about GhostSlayer. But Family Go-Kart Racing, not so curious. Could be a cheap alternative to Mario Kart. Flipper should be ace. Flight Control is a can't miss. And Aura Climber has potential... Always nice to have more nice 200 pt. games. All in all, a solid week for DSiWare. 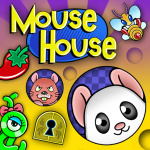 Mouse House seems like a simple, fun puzzle game in the spirit of Adventures of Lolo. GhostSlayer looks like it should be a solid re-skin of Wii Sports Resort sword battling. I'm willing to give both a chance... Looking forward to impressions/reviews. I have a question....why is there auch a large amount of hype surrounding Flipper? It sounds like it might be a good buy but nothing that looks to be earth-shatteringly good about it. So where did all the hype come from? I think I read that it only has like 20 levels. I'm curious how the motionplus handles for slayers. Ooh, only 600 points. I'm really tempted to just get it now, but I better wait for a review or at least some impressions from someone. Anyone else about to throw themselves on the ghosts. Seems like no one wants to take any chances after that recent shooter iphone port thing. <-Pretend that's angrier than it looks, since we don't have an actual angry emoticon. Okay, so I know Europe has been missing out on VC a LOT lately, and I do sympathize...but that doesn't make me any less mad when we get a VC-less week. Hey NoA, how about you FINALLY give us Mario's Super Picross and Devil World, huh? That'd make for GREAT space filler! To make it worse, I'm not interested in anything released on WiiWare or DSiWare. Blame NA consumers for no VC? Please, blame Nintendo and third parties for not putting decent VC games on there and blame Nintendo for not marketing VC to the point were it becomes so profitable that third parties would flood the gates with VC games. Flipper has hype because it's been in development for a while and the creator has did his rounds of forum/site interviews, people seem to connect when developers are more communicative. Also the majority of the DSiWare library is crap so when a good game seems to come out, people get excited. Not a very impresive update, but GhostSlayer and Mouse House sound decent, will see. The lack of VC is sad, but I just hope people doesn't start threads about how the VC is "over" or something. I'm taking on Mouse House tonight and purchasing Ghost Slayer (Jon is reviewing that one). Whilst I won't guarantee any 24hour review turnaround, if either of them is to be avoided at all costs, I'll chime in on the the preview thread in the forums. Just downloaded aura aura it is a unique little game that is pretty fun and addictive it is a little slow but there are many oppertunities to preform acrobatic stunts which are fast fun and give you more points. The graphics are also really good. Very artsy. (if that is a word) There are also a lot of power ups icluding longer grapple, bombs, boost jumps, and UFOs which give you extra points. I'd recommend this game to anyone it is a huge bargin for only 200 points. However I am not clear on how long the game is yet. lol, VC is crap anyway I'd never pay for anything on that service especially with shoddy Euro 50htz games, I just use homebrew channels emulators which offer full 60htz and smoothed out edges. I'd rather support Wiiware developers. @Stuffgamer1. I think Devil World is never coming out in America and my reason of thought is NoA has concerns over their public image (crazy fundamentalist Christians might getting the wrong idea...similar to the Beatles might rise from their grave and sue Nintendo over Earthbound). For a similar reason I doubt the Today and Tomorrow channel will ever hit US shores (it uses Astrology...well some sort of Ephemeris actually...). Oh yeah almost forgot. Mario's Super Picross has the trouble of all its content being released as DLC for Picross DS (in US and Japan). @TwilightV. Isn't Wednesday Wii channels usually? The only ones missing (which I remember) are the Band Bros channel (won't happen without the game; the game isn't happening), the Fujifilm photo channel (put photos from an SD card and put them in silly frames then send off to get printed...all through the power of the Wii), Wii no ma channel and the aforementioned Today and Tomorrow. @Starwolf_UK: Actually, I said that because that's the day of the US media summit. I'm just thinking something will be released considering that last year's media summit brought the Virtual Console Arcade. Well, I have bought into the hype behind Flipper, so I will get that tonight. I may possibly check out aura aura climber as well. These 200 point DSi games are getting better and better. In fact, DSi ware as a whole is really impressing me. I wouldn't say that Flipper has been overly hyped; to me, it just seems like a fun, simple idea from a developer who enjoys what he does and lets everyone in on the process. I'll be downloading it for those reasons, but I certainly don't expect it to be the greatest offering on the service to date. 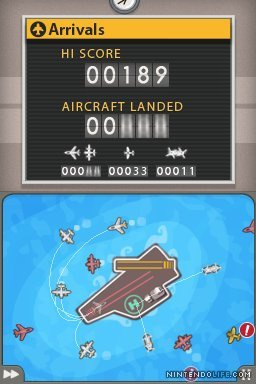 @StarWolf_UK: Actually, only a small portion of the puzzles from Mario's Super Picross are available on Picross DS (and by small portion I mean 10). The majority of the DLC covers the Nintendo Power Picross expansion/game things that were released in Japan. As for Devil World, you may be right. Doesn't mean I'm not hoping for it. After Brawl with the Assist Trophy and PiCTOBiTS with TWO levels devoted to the game, it's understandable that I wish NoA would just stop being a bunch of wussies and release the damn thing already. And this is coming from a Christian who has the sense to tell the difference between a weird quirky piece of fiction and something to be feared and fought against the release of. @TwilightV: I hadn't heard you say that yet, actually. You make a good point. I suppose I'll reserve final judgement for a couple more days, then. Not that I'm actually expecting much...would NoA really have the sense to make lightning strike twice? wow, with the exception of Sonic & Knuckles its been weeks since i got anything, and there's actually lots of ANNOUNCED games (and not just ones on a far-fetched wish list) that i've been waiting for. Not that my VC wish list isn't huge or anything. I just did some research in the backlog of NLife news and found something less than encouraging: Last year, we got TWO VC games on the Monday before the VCA launch. So that launch didn't really need to "make up" for anything last year, whereas we're stuck hoping it might this year. Flipper. Cool. Also Ghost Slayer looks interesting. Epic Ghostbusters reference. Nah, Devil World might never come out due to "separation of church and state," even though the game is, in a way, actually pro-Christian. Super Mario Piccross, though, might have a chance. Heh, I would rather wait and see for next week. Ghostslayer looks pretty cool, I will wait for a review though. Cave Story must be vaporware. @MarkyVigoroth: "Separation of Church and State" has literally NOTHING to do with this issue. The only way it could possibly matter is if the governement were to release this game as opposed to a company like Nintendo. Obviously, THAT'S not going to happen. Oh wow, no VC game this week! Other than that, meh week for me. The fact that Rocket Knight Adventures and other classics hasn't been release yet, makes it meaningless to skip VC. Hopefully next week Nintendo gave us some 3 VC games to celebrate it's 350th game release. I'm happy that Sonic & Knuckles is out but there's no excuse for no VC game today. They could of released Mega Man 4 today! Crap week. At least there's Mega Man 10 to look forward to next Monday. @lz: Nothing like no release at all to make you wish for a return to weekly crap, and I mean that quite seriously. Every week we get NOTHING is just a waste of time. The crap games will still come eventually, and they'll most likely push back the release of the GOOD stuff even FURTHER. @ocarinaoftime: Oh, they took the lesson, all right; complete with removing/nerfing the feature down the line. No VC is a pile of crap. THere are soooooo many games that can be released, they could have at least thrown us some total crap VC games just to get them out of the way. Bull Crap! @MarkyVigoroth Please look up what "seperation of church and state" means. Since we got ssb I said I will never complain about vc so Im not worried one bit for no vc this week. I hope GhostSlayer has true hit detection and parrying abilities unlike Wii Sports Resort that uses offensive and defensive modes between which you have to contantly switch. If it does and works well, I'll get it despite the ugly, creepy visual theme. I'll be waiting for that review of Ghost Slayer. Looks good on paper. Boo no VC titles this week. So where the heck is Cave Story? As far as I remember the project was completed well over two months ago. I've got plenty of other games to play, so that's not my worry. It just seems ridiculous to me that a completed game keeps getting delayed like that. Where is the games I am wishing for a Virtual Console release? Get it together Nintendo, this games are already made. Making up for the multiple VC weeks we got around the holidays, I guess. The 14-year-old in me realized how "Faceez" sounds eerily similar to another certain word. Blame North America for the lack of VC updates? That's ridiculous. Nintendo has done a terrible job of even making it known which games are coming and which games are available. Also, with the exception of the big name games, most people have never heard of or played most of these games. If Nintendo could offer a gameplay video or a demo, people might be more inclined to buy these games. Also, Nintendo needs to look at their pricing scheme. $8 for a Genesis game is really high, especially if they're hoping people will buy them on a whim. $5 for Super Mario Bros. 3 is fine, but $5 for Ice Climbers is ridiculous. How about tiered pricing? It doesn't matter what we say anyway. Nintendo isn't listening, and even if they were, they could care less. OMG! Oh Noez. No VC games! WE'RE ALL GONNA DIE! I think some people here are being a little overreactive. I was hoping for an VC release as well, but didn't you people see this coming? After the great holiday season (Late October-late December), didn't you people seriously not expect an no-VC week update? I personally think this week is okay, but I'm not complaining about not having an VC week because we probably already have hundreads of solid games on the service. Mega Man 4 would have been a great tie in since Mega Man 10 is coming out next week. SSBF is calling OTHER people overreactive? Sorry man, and I mean no offense, but...that just strikes me as incredibly ironic. @Swiket: I noticed that, too. Matter of fact, I almost thought that WAS what it said at first. It was an okay week but nothing too spectacular. DSi got the best offerings this week with Flight Control and Flipper. GhostSlayer and Mouse House seem decent enough but I think that I'll wait for the reviews on those two games. Whenever there is lack of a Virtual Console release, it always feels like a disappointment to me. @Stuffgamer1: I'm not offended by your statement at all, but in case you haven't notice, my behavior towards the Virtual Console has changed a lot since the no VC in Summer, 2009 debacle. I promised unless the week was truly bad, I would never complain about the Virtual Console updates again (Weekly updates). Although this could file as one, we already got strings of solid weeks making up for this one. There is no need for concern unless we go another week without a Virtual Console update. @Kobayashi: Those prices seem quite low to me. What you're basically saying is that these games (even the really awesome ones) aren't worth more than the prices you say. I say that if the awesome ones were worth somewhere around $40-$60 at launch, they're DEFINITELY worth up to $10 now. @SSBF: Yeah, I guess I did miss that. Very good, then...it actually sounds like you're LESS annoyed by this week's release than I am. Not that I'm fighting mad or anything...just kinda miffed. Better be a game next week or I probably WILL start to get pissed off, though.